I have a longing and a desire for fulfilled, quality relationships in my life. Most of us are hardwired with this same desire. I love nothing more than a girl’s night out or when my husband and I go out with our couple friends. It rejuvenates me. It makes me feel happy and gives me a sense of belonging. How quickly those feelings of happiness and belonging can disappear though. The next morning a simple text (or lack of a text) or social media post can undue those wonderful feelings of happiness and belonging. A new type of feeling begins to creep in and enter my thoughts. You probably know the feeling. It begins as your stomach starts to set in. You wish that your mind wouldn’t allow the thoughts to come that are quickly crowding your brain. Even if you know deep down that they aren’t true, the thoughts still come. In a matter of seconds, you suddenly feel unloved or cast aside. Whether it’s a friendship or a romantic interest, this is what I’ve learned about finding fulfillment through my relationships. The enemy wants nothing more than to make us feel isolated and alone. He wants to destroy anything that is holy and good. He wants to take away any relationship that continues to push us forward in our faith or that shines the hope that we have because of our relationship with Jesus. We are so much better together. I know for a fact that I love running towards Jesus with my friends and family. Don’t let the enemy unnecessarily steal that from you. Can you see the hope in those words? Jesus is the brother that will never leave our side. Even if everyone turns their back on you, He never will. Jesus is a constant relationship in our life. He will never isolate us. When the ugly lies about my relationships begin to enter my thoughts, it gets dark. I have a hard time keeping things in perspective, feeling fulfilled, and simply allowing God to work through the situation. When we allow Jesus to take our thoughts captive, He redeems and restores them. He gives us the grace to extend forgiveness, and He often changes the way we view the situation. This can be a constant battle for me. I have to give my thoughts to God before my feet even hit the floor in the morning instead of springing to my to-do list. I have to make sure I’m in my Bible reading the truth and not always scrolling social media. These are simple, yet hard, acts that keep my thoughts captivated towards Jesus. There are times when we have to let friendships change or end. Sometimes we choose it, and sometimes we don’t. Whether we choose it or not, it’s hard. Switching jobs and moving are two life events that have changed numerous friendships for me. I have often wondered if lost friendships were truly real if they could end so easily. Do you ever think this? I naively feel like I have the ability to keep ALL of my friendships no matter where life takes me. I’m a bit of an overachiever! In my experience, it can be difficult for me to love the people right in front of me if I’m constantly looking to the past. Sometimes we have to drop a trail of blessings on past friendships as they change or end. It’s healthy, and it may be part of God’s plan. It doesn’t mean that we love those people any less. There will be a time to keep friendships and a time to bless them as we walk away, and that is OK.
Here’s the bottom line about fulfilled relationships. There are no perfect people; therefore, there are no perfect relationships. We extend grace and love those around us to the best of our ability. God is the ultimate Fulfiller of our desire for relationship. God will ultimately satisfy you. No matter where you are at with your relationships, I pray that you allow Him to be the one that truly fills you. We may fight feelings of isolation. Occasionally, we have to take our thoughts captive. We may have to drop a trail of blessings as we walk away. If we continue to seek Him, He will give us that fulfilled relationship that our heart desires. Lauren Elizabeth Miller is the writer/blogger at laurenelizabethmiller.com. Her passion is to serve her readers through words. 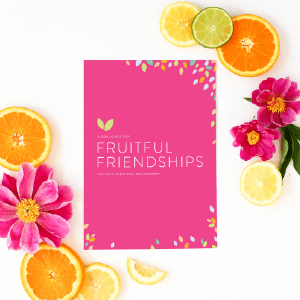 Lauren does this by sharing her experiences with friendship, motherhood, perfection, leadership, and adoption all while pointing to the author and Perfecter of it all, Jesus. She is working on her first book titled Made for More.